Seriously? I'm in love. Head over heels. I don't think you even understand. I'm a lucky girl, because the company I work for gives us great deals on vehicle leases, otherwise there's no way I'd be getting a brand new car every three years. For the record, I am not that cool. Nor am I that rich. So, I pretend that I am both of these things while leasing a car. There's something about saying, "Oh, yeah. That's just my new lease." It makes me feel fancy. I quite enjoy it. Anyway, the car I've had for the last three years is the Scion xA, and that car was one of my favorite things in the entire world. I pretty much wanted the same exact car for my new lease, but they apparently don't make that model any more. So, I opted to get the xD, which is just an eensie bit bigger and has a few different features. And I got the same color. I fear change, apparently. When I arrived to pick it up this morning, I was incredibly giddy. As the guy was checking in my old vehicle, I couldn't help to let out one of my velociraptor screeches, due to my extreme excitement. I think the guy laughed and was secretly judging me, but he should have been glad that I didn't say what I was really thinking, which was: "I'm kind of sweating and want to throw up, because I'm SO HAPPYYYYY! HUG ME, WILL YOU?" I didn't think that would go over well, so, I stuck with the raptor noises. I know I'm going to sound like a commercial, but I absolutely adore Scions. They are priced well, they run well, they are adorable, they have built-in iPod connections, they can make it across the country and back without giving you any problems (even in a blizzard when you don't have snow tires), they have incredible gas mileage. Basically, they are the greatest ever. Amen. So, I'm happy. It's a good day! It's SO beautiful, the colour is perfectly you! Are you going to go cruising California to show her the sights? Have fun with it! its so preeeety. i have been eying that very model, only in red because i'm obnoxious like that. Hooray for your new ride. New car small can't be beat. It's very cute! Congrats on the new car! a teense bigger this model is you say? I love Scions too, they are great. Perhaps they'll be one of my next cars...someday...when my Corolla dies...but I love my Corolla...so it won't be for a good while I think. cute! hopefully i won't leave my keys in the back seat of this one. love the color! are you naming it? Making Monica noises for you. I am jealous! Its such a beautiful car... Gun metal grey is one of my top 3 favorite colors on a car. And I feel the same about Scions. I have a 2005 White Pontiac Grand Am that makes me feel amazing driving it, but everytime I see a Scion, I yearn to drive/own it. Leasing is amazing, my grandma taught me that. Ohh that is gorgeous! I hope you have a lot of fun just cruising around. It's such a great colour. I can't imagine how giddy you must have been. I'm in the process of purchasing my first car (very very soon) and I'm sooo excited. I smile anytime someone says "new car" lol. congrats on the new ride. it's very cute. Congratulations!! That's such a cute car!! Congrats! That is very exciting! I love that new car smell. Sweet car! I need to get a new one this summer, maybe I'll check out the Scion. I'm jealous!!! I'd love to get rid of my car for a new one. love the "new lease." 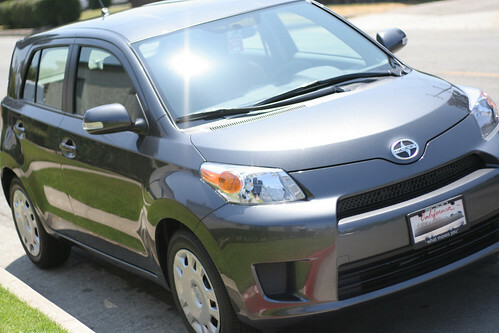 I have been wanting a new car and I was thinking about a scion. glad to hear they are so great! will definitely check 'em out once I get the cash. btw, I love your blog. I have been reading for a couple weeks and am just now delurking myself, as they say. Not going to lie...I am jealous!! I am officially 100% jealous of you. I have a present for you at my blog! I swear I make raptor noises every single day. I thought I was the only one! Toyotas FTW! (yeah I can say that because I am a nerd). My boyfriend has the Tc, I have a Corolla..however! I wish I would have bought my car in that color. Although I want to basically kill myself whenever summer comes along and I have to get into a dark colored car (shooooot me!). It is so cute, and totally fits your personality, I think! I love the color and it looks so stylish :) Congrats!! I loved your description of how you felt and your squeal--I think it fits just from knowing what I read actually! :) Very cute! im with you on that! I love my scion! Hot wheeeeels! I have never had my own car... except for my parents' third car they let me use until I moved out. I aspire to one day own such an adorable and tiny vehicle.